Tonight's episode will be so funny! I'm here to give you the report so put your tin foil hats on and click the cut! Or don't click it if you don't want to be spoiled! Man, it was cold today! We were let into the waiting area at 3:30 and I was there from 12:30! It's a shady area and the wind cut right through me. Yikes! There were a lot of awesome people in the line with me. A nice Canadian family and a mother and daughter that flew in from Minnesota for her birthday just to see Craig, what dedication! I counted seven "official" RSA shirts in the crowd and one guy had a completely different RSA shirt, it was pretty badass! We were finally let into the waiting area, fingers and toes frozen, to wait around some more before going into the studio. Chunky B warmed us up with the same old jokes. It's okay though, I adore Chunky! If it weren't for him the event in my icon wouldn't have happened! So Chunky has a very special place in my fangirl heart. Anyway, Chunky warmed us up again in the studio. Man, it was a full house tonight! They brought chairs out into the aisle and we were all getting our groove on! Chunky got heckled and got all pissy (not seriously). It was great, we were all giddy over Geoff Peterson! ~Cold opening....a song!!!! Usually when they start they launch into the opening and Craig comes out for the monologue. This time it was the cold opening. Craig came out to say howdy to us before telling us what was going on. I knew it was something special since they had the curtains in front of the camera. Craig came out without his suit jacket and his sleeves were rolled up (om nom nom). He said hi to us and told us that he thought there should be a song tonight! We kinda spazzed out. Then he introduced Jeff, the security guy and Chris (Gunter!). I don't know what the song was but who cares! It involved Craig, Jeff, Chris, three blonds playing horns, Wavy, and Geoff Peterson! Man, that was a hot opening. You first see his tattoo and they do the song, and his shirt sleeves are rolled up and he did a little pelvic thrust here and there. Mmmmm!!! Seriously, he looked extra good today! He always looks good but there was something about him tonight..extra delicious! He bantered with us a few minutes and then went off stage so he could enter again and do his monologue. 3. My favorite is Dolly Parton! 4. Who's that at the door? Craig also showed the video of the intern's adventure to pick up Geoff. Two gay interns in San Fransisco and Geoff comes to life and farts. It made me lolz. Kristen Bell was adorable as always! They talked about robots and she mentioned her first robot memory being Vicky from Small Wonder (one of the first people that cheered was me, Small Wonder ftw!). She got engaged and talked about being gassy on an airplane, lmao. Dyson vacuums with the proper amount of suction were also talked about. The ending was Craig and Geoff. Tonight's episode is definitely awesome, I couldn't stop laughing at all! OH! I went to the CBS gift shop and they have LLS mugs now as well as the shirts! Totally got a mug. When going back to my seat a girl in a RSA shirt said "You're Sara!" Lmao, I'm famous within the LLS crowd! Jeff, the security guy (black guy in the song number) recognized me too. Gave me a fist bump and said "We just can't keep you away." 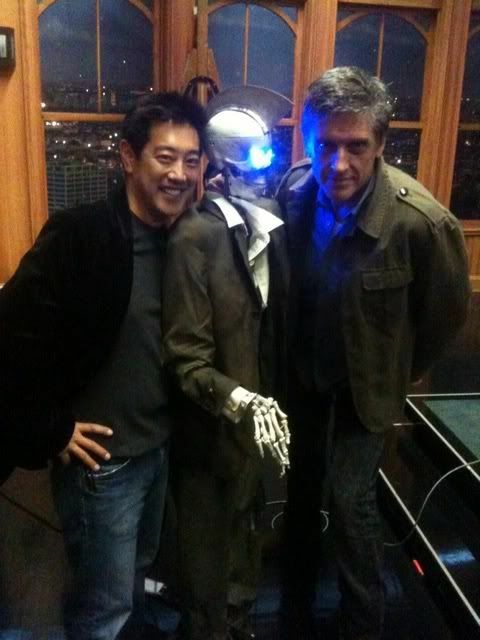 Tags: craig ferguson, fangirl squee!!! YOU ARE BECOMING A REGULAR! I KNEW YOU COULD DO IT, GURL. I AM SO PROUD.